One of the best but also more challenging ways to get your insights across is to visualize them: that way, you can more easily identify patterns, grasp difficult concepts or draw the attention to key elements. When you’re using Python for data science, you’ll most probably will have already used Matplotlib, a 2D plotting library that allows you to create publication-quality figures. Another complimentary package that is based on this data visualization library is Seaborn, which provides a high-level interface to draw statistical graphics. Today’s post will cover some of the most frequently asked questions users had while they started out working with the Seaborn library. How many of the following questions can you answer correctly? How To Use Seaborn’s Colors As A colormap in Matplotlib? Interested in a course that covers Matplotlib and Seaborn? Take DataCamp’s Introduction to Data Visualization with Python. 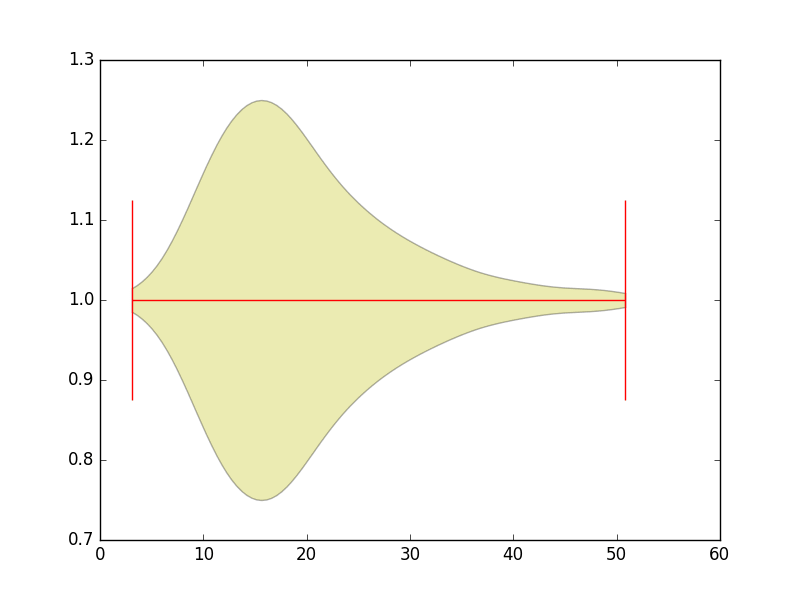 One of these hard things or frustrations had to do with the default Matplotlib parameters. Seaborn works with different parameters, which undoubtedly speaks to those users that don’t use the default looks of the Matplotlib plots. The examples above also makes another frustration of users more apparent: the fact that working with DataFrames doesn’t go quite as smoothly with Matplotlib, which can be annoying if you’re doing exploratory analysis with Pandas. And that’s exactly what Seaborn addresses: the plotting functions operate on DataFrames and arrays that contain a whole dataset. 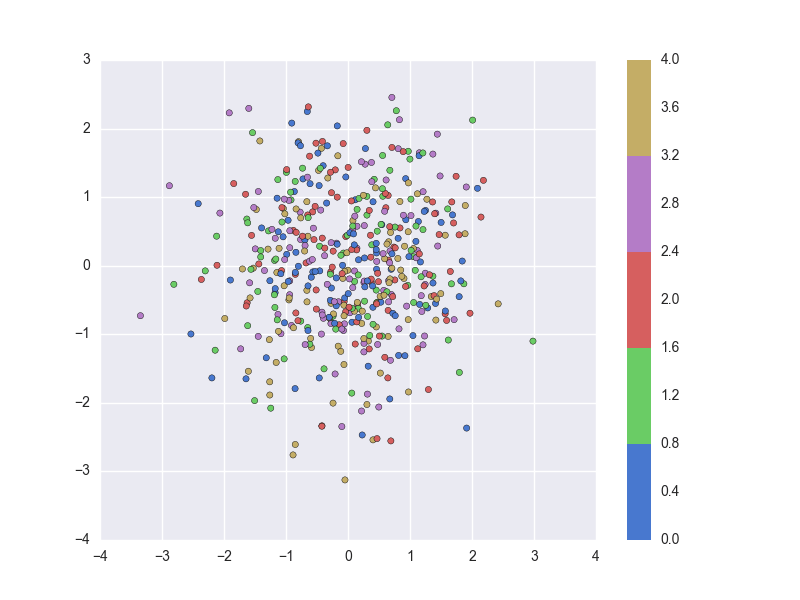 As Seaborn compliments and extends Matplotlib, the learning curve is quite gradual: if you know Matplotlib, you’ll already have most of Seaborn down. Viewing Volumetric 3D Data with Matplotlib tutorial on matplotlib’s event handler API. 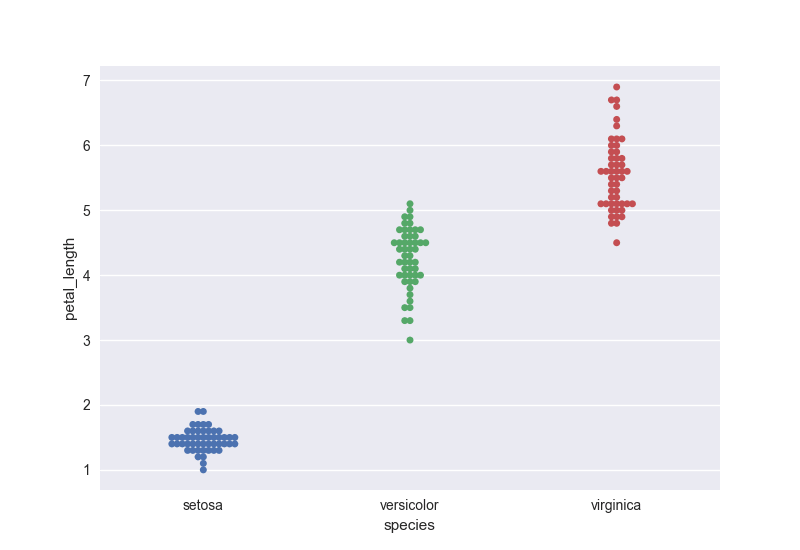 When you’re working with Seaborn, you can either use one of the built-in data sets that the library itself has to offer or you can load a Pandas DataFrame. In this section, you’ll see how to do both. As an anecdote, it might be interesting for you to know that the import convention sns comes from the fictional character Samuel Norman “Sam” Seaborn on the television serial drama The West Wing. It’s an inside joke by the core developer of Seaborn, namely, Michael Waskom. 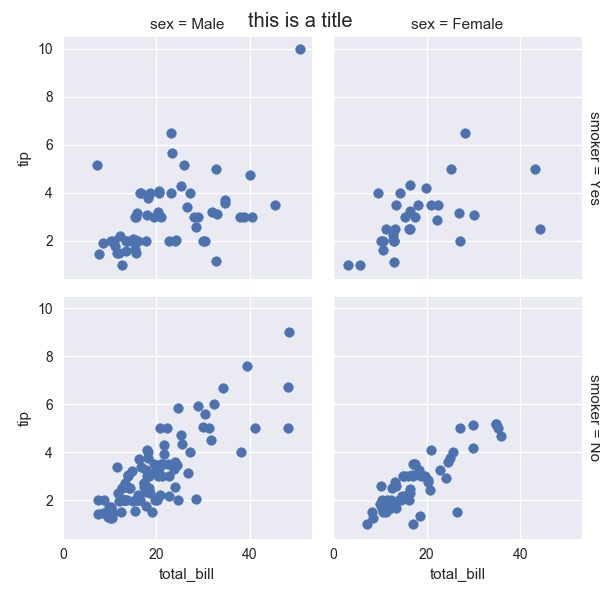 Of course, most of the fun in visualizing data lies in the fact that you would be working with your own data and not the built-in data sets of the Seaborn library. 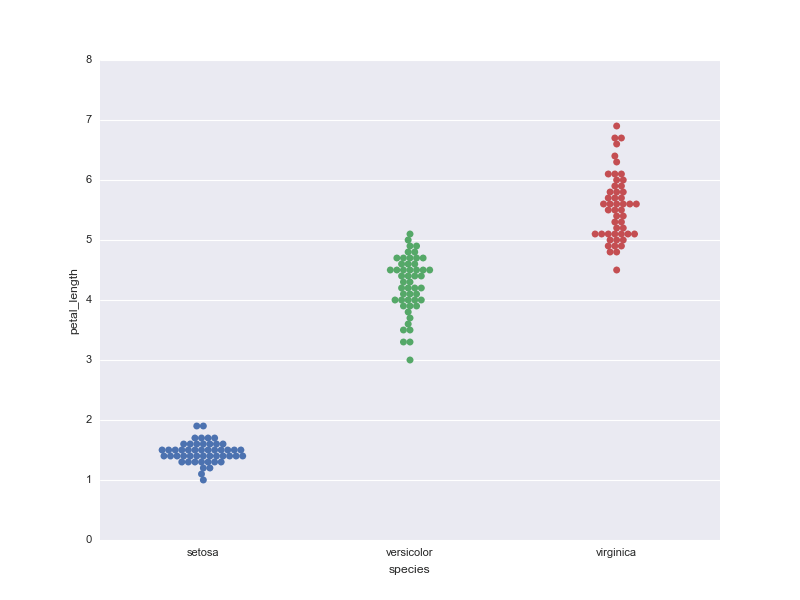 Seaborn works best with Pandas DataFrames and arrays that contain a whole data set. Remember that DataFrames are a way to store data in rectangular grids that can easily be overviewed. Each row of these grids corresponds to measurements or values of an instance, while each column is a vector containing data for a specific variable. This means that a DataFrame’s rows do not need to contain, but can contain, the same type of values: they can be numeric, character, logical, etc. Specifically for Python, DataFrames come with the Pandas library, and they are defined as a two-dimensional labeled data structures with columns of potentially different types. 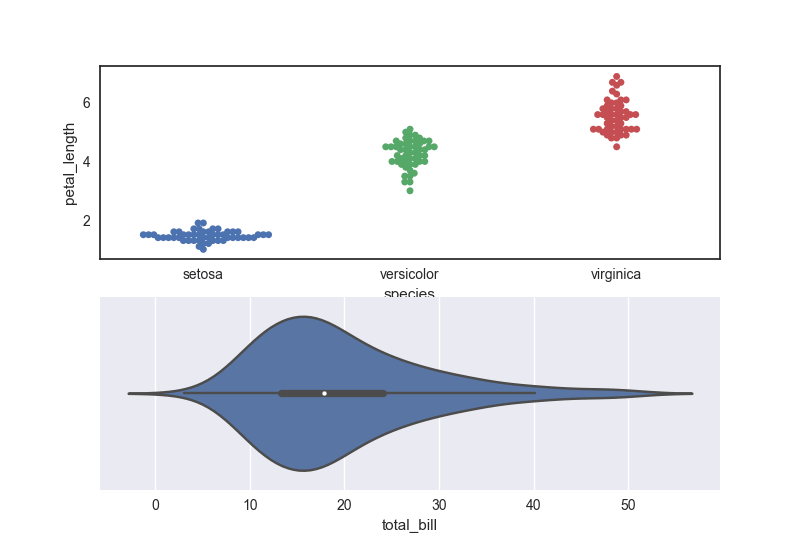 The reason why Seaborn is so great with DataFrames is, for example, because labels from DataFrames are automatically propagated to plots or other data structures, as you saw in the first example of this tutorial, where you plotted a violinplot with Seaborn. 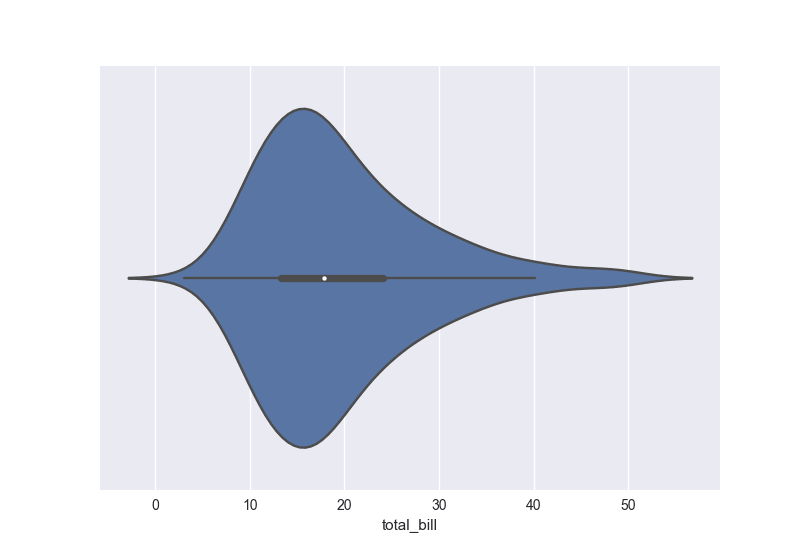 There, you saw that the x-axis had a legend total_bill, while this was not the case with the Matplotlib plot. This already takes a lot of work away from you. But that doesn’t mean that all the work is done -quite the opposite. In many cases, you’ll need to still manipulate your Pandas DataFrame so that the plot will render correctly. If you want to know more, check out DataCamp’s Pandas Tutorial on DataFrames in Python or the Pandas Foundations course. Note that in the code chunk above you work with a built-in Seaborn data set and you create a factorplot with it. A factorplot is a categorical plot, which in this case is a bar plot. That’s because you have set the kind argument to "bar". Also, you set which colors should be displayed with the palette argument and that you set the legend to False. As you read in the introduction, the Matplotlib defaults are something that users might not find as pleasing than the Seaborn defaults. However, there are also many questions in the opposite direction, namely, those use Seaborn and that want to plot with Matplotlib defaults. Before, you could solve this question by importing the apionly module from the Seaborn package. This is now deprecated (since July 2017). 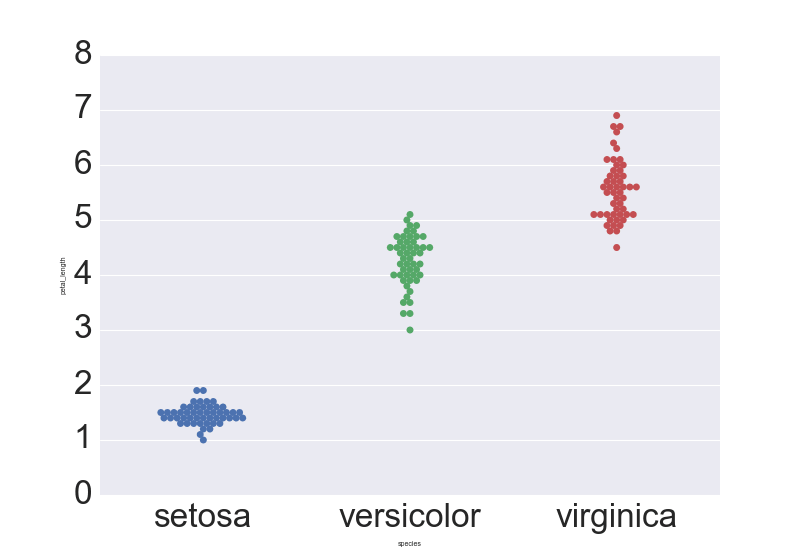 The default style is no longer applied when Seaborn is imported, so you’ll need to explicitly call set() or one or more of set_style(), set_context(), and set_palette() to get either Seaborn or Matplotlib defaults for plotting. Besides using Seaborn with Matplotlib defaults, there’s also questions on how to bring in Seaborn colors into Matplotlib plots. You can make use of color_palette() to define a color map that you want to be using and the number of colors with the argument n_colors. In this case, the example will assume that there are 5 labels assigned to the data points that are defined in data1 and data2, so that’s why you pass 5 to this argument and you also make a list with length equal to N where 5 integers vary in the variable colors. Tip: do you need to revise NumPy? Consider this NumPy Tutorial or the NumPy cheat sheet. The four predefined contexts are "paper", "notebook", "talk" and "poster". Tip: try changing the context in the DataCamp Light chunk above to another context to study the effect of the contexts on the plot. Note that in the first code chunk, you have first done a reset to get the default Seaborn parameters back. You did this by calling set(). This is extremely handy if you have experimented with setting other parameters before, such as the plot style. 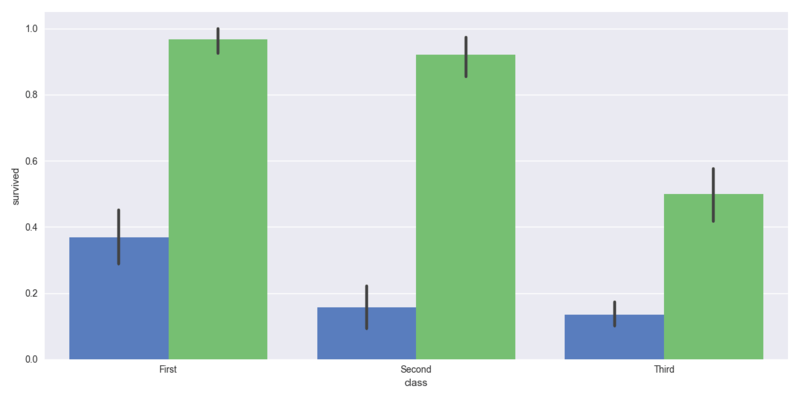 One of the hardest things about data visualizations is customizing the graphs further until they meet your expectations and this stays the same when you’re working with Seaborn. That’s why it’s good to keep in mind the anatomy of the Matplotlib plot and also what this means for the Seaborn library. 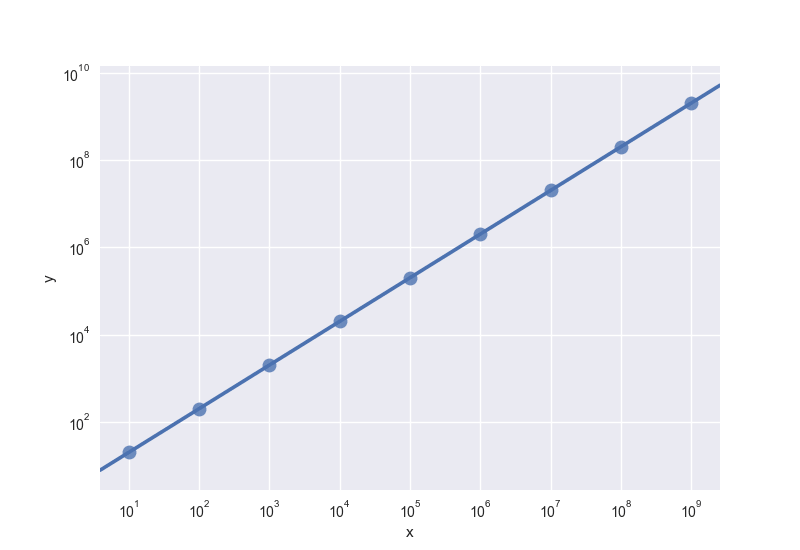 As for Seaborn, you have two types of functions: axes-level functions and figure-level functions. 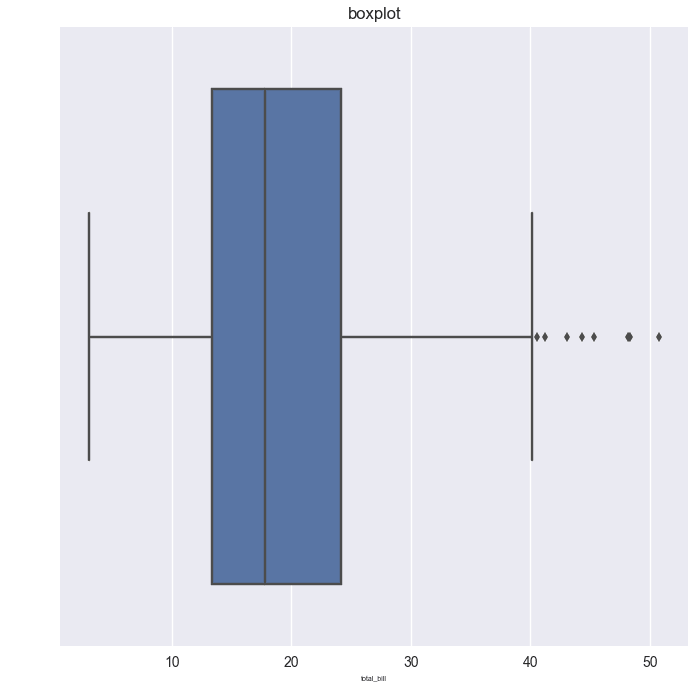 The ones that operate on the Axes level are, for example, regplot(), boxplot(), kdeplot(), …, while the functions that operate on the Figure level are lmplot(), factorplot(), jointplot() and a couple others. 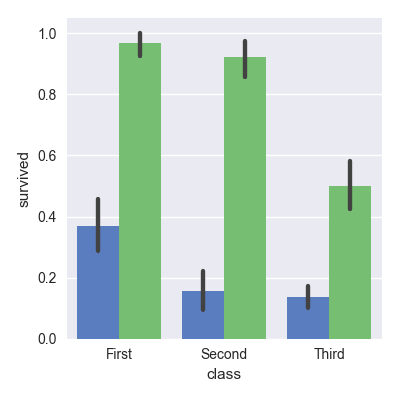 This means that the first group is identified by taking an explicit ax argument and returning an Axes object, while the second group of functions create plots that potentially include Axes which are always organized in a “meaningful” way. The Figure-level functions will therefore need to have total control over the figure so you won’t be able to plot an lmplot onto one that already exists. 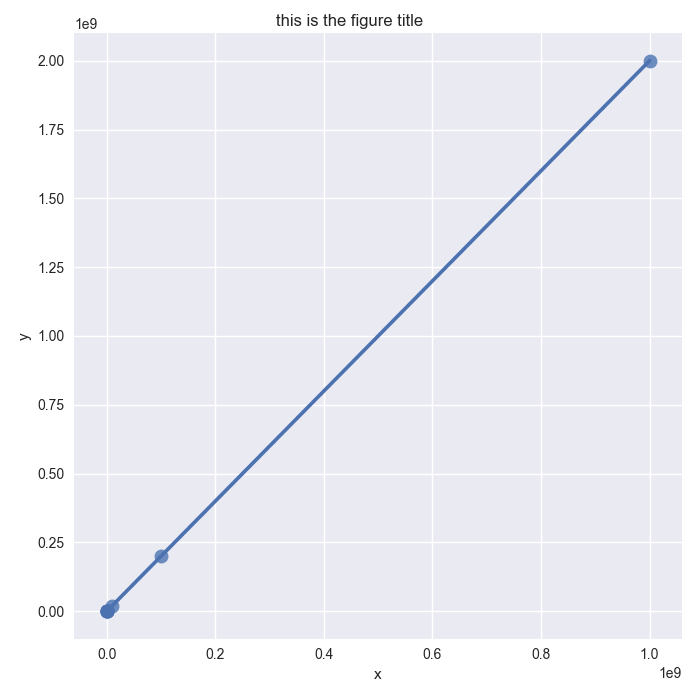 When you call the Figure-level functions, you always initialize a figure and set it up for the specific plot it’s drawing. However, you see that, once you’ve called lmplot(), it returns an object of the type FacetGrid. This object has some methods for operating on the resulting plot that know a bit about the structure of the plot. It also exposes the underlying figure and array of axes at the FacetGrid.fig and FacetGrid.axes arguments. When you’re customizing your plots, this means that you will prefer to make customizations to your regression plot that you constructed with regplot() on Axes level, while you will make customizations for lmplot() on Figure level. For axes level functions, you can make use of the plt.subplots() function to which you pass the figsize argument. 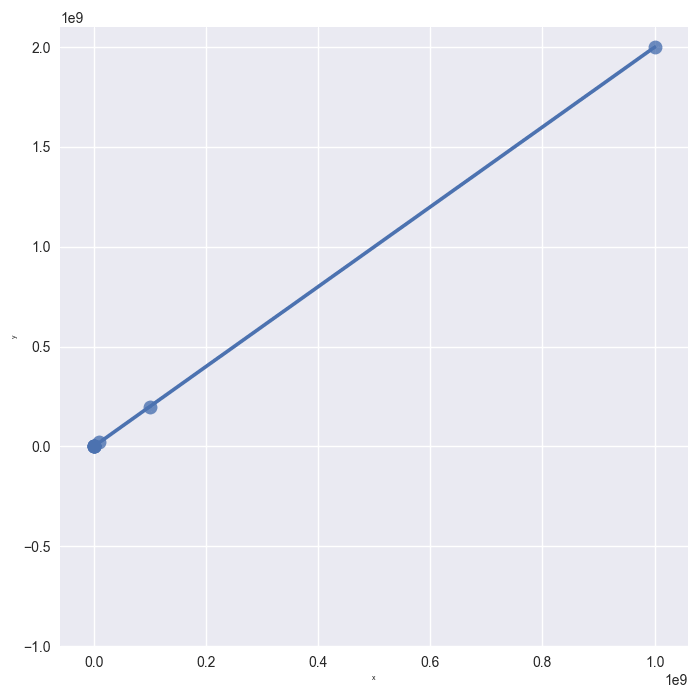 Note that alternatively, you could have also used ax.set_xlim(10,100) to limit the x-axis. Likewise, FacetGrid exposes the underlying figure with the help of the fig argument. You can modify the scale of your axes to better show trends. 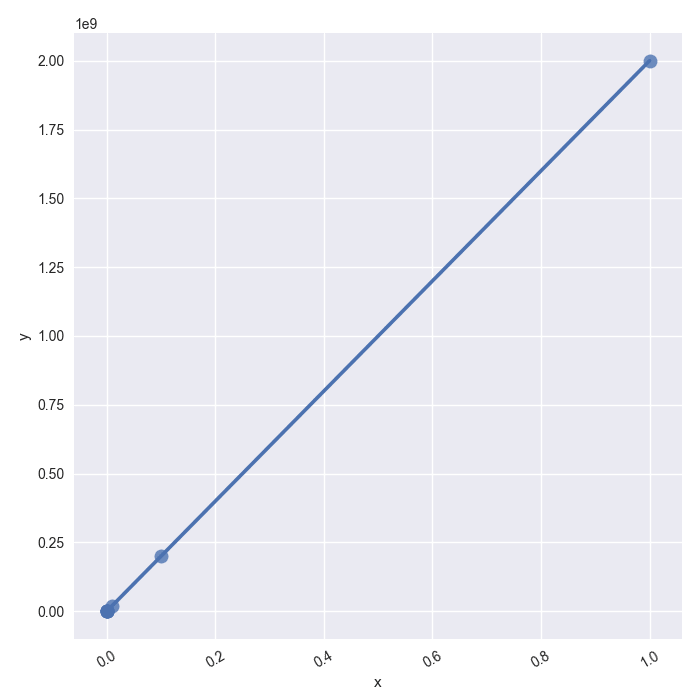 That’s why it might be useful in some cases to use the logarithmic scale on one or both axes. 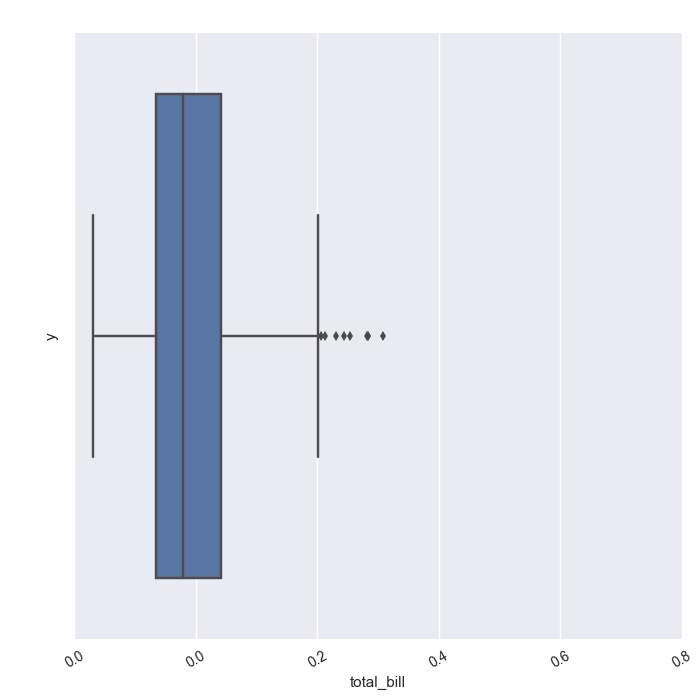 For a simple regression with regplot(), you can set the scale with the help of the Axes object. Congratulations! 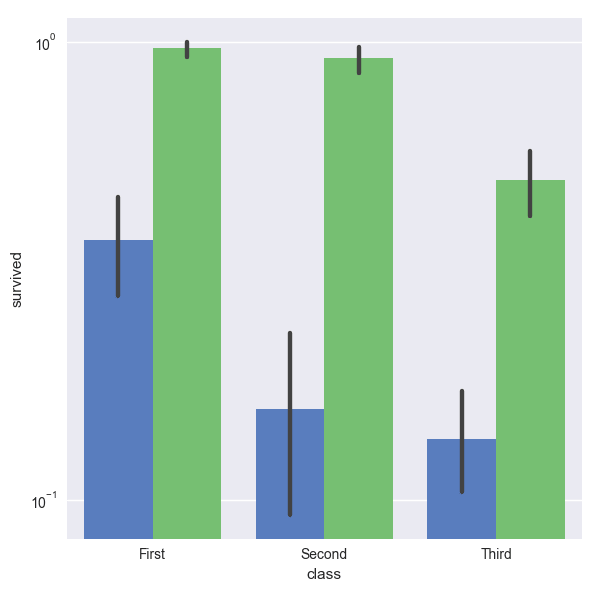 You have finished this Seaborn tutorial for beginners. If you are interested in interactive visualizations, check out DataCamp’s Interactive Data Visualization with Bokeh course! In this course, you’ll learn how to create diverse, rich, data-driven, and interactive visualizations with Bryan Van de Ven, developer of Bokeh and software engineer at Continuum Analytics. While you’re at it, also don’t miss out on DataCamp’s Bokeh cheat sheet.